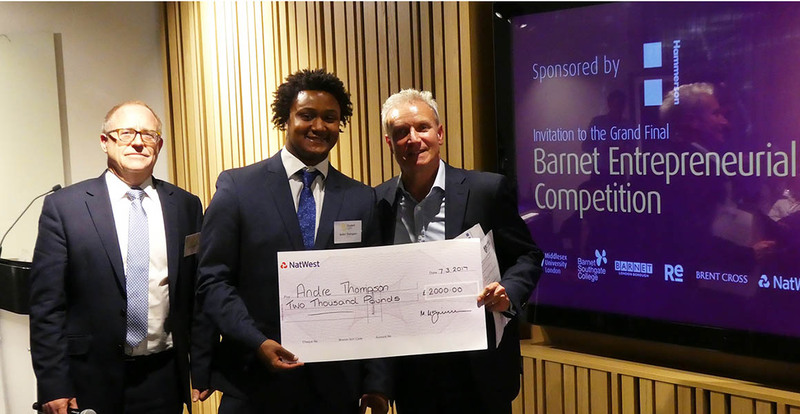 Middlesex University student Andre Thompson was crowned 2017 Entrepreneurial Barnet winner on Tuesday 7 March after he successfully pitched his Student Light idea to the competition judges in the grand final in London. The MA Creative Technology student beat off tough competition from four other budding tycoons from across the borough to clinch the £2,000 cash prize and ongoing expert mentoring. Student Light is an app and web platform designed to liberate students from the common barriers and adversity they face, particularly around mental health issues. The idea is to connect individuals, communities and leaders within and across higher education institutions and empower them to create positive change in their own and other people’s lives. Andre is proud to be highlighting mental health issues in universities. “I’ve been working so hard on this with students, finding out what they want and the struggles they face and trying to come up with solutions,” he says. “I really hope this business can make a real difference and this money will pay for start-up costs including software and licenses. “My time at Middlesex has helped me massively; not just the support from lecturers but also the support from students. Every time I feel like giving up or quitting I think of the students who have made a difference to my life and I just want to give back. Also pitching their business plans to the expert panel in the final were Middlesex undergraduates Bethany Flower and Jasmine St Cliere with their project Agent Dance. Bethany and Jasmine received a cheque for £500 and a banner for their business. David Williams, Director for Corporate Engagement at Middlesex University, says the competition is a valuable opportunity for young entrepreneurs. "We are delighted this competition has attracted and inspired students from across the University and our partners,” he says. The competition is an annual collaboration between Middlesex University London, Barnet & Southgate College, Barnet Council (Capita RE) and NatWest, supported by Brent Cross and sponsored by Hammerson. The final was hosted at Hammerson’s head office in London.